Born an raised in the multicultural nationhood of Ybor City, Tampa helped me to form many different interests in Art. 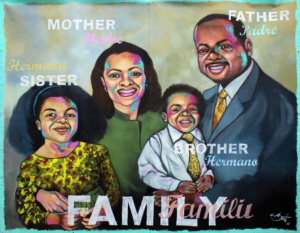 Art rich in color and the texture of growing up in a large family. (6 Sisters and 2 Brothers. 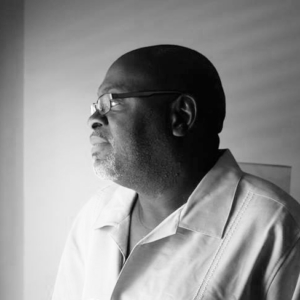 Herbert found his identity in art.Herbert graduated from Robinson High School and earned a degree in Advertising and Marketing from the Art Institute of Ft. Lauderdale. After working in the marketing, advertising and computer technology feilds for a number of years his interest turned to fine art. His work can bee seen in many different galleries and at the Enoch Davis Center as well as in murals at Perkins Elementary, John Hopkins Middle School and the Royal Theater Boys and Girls Club. His years of working in the art industry, both comercial and fine art and his exposure to different cultures all played a part in the art he creates today. When given the freedom to express my thoughts as an artist, I am motivated to say as much as can be said in a simple image, I created this piece for the Tapestries project inspired by the message of Family, because it is the foundation on which achievement begins, we must re-focus on the foundation to move forward as a community.